This Sunday, 23 September, is Bi Visibility Day – George Alabaster, Stonewall’s Digital Officer and co-chair of its Bi Staff Network, talks about the challenges the bi community face and how we can all play a role in addressing biphobia. Bi people are often the forgotten part of the LGBT community. Our experiences are commonly assumed to be the same as lesbian and gay experiences, and our identities are frequently made invisible or dismissed as something that doesn’t exist, by people both inside and outside of this community. We face a number of negative stereotypes, the primary ones being that we’re greedy, manipulative, incapable of monogamy and unable to make our minds up – the last of which is the same as saying who we are isn’t real. The assumptions about bi people are also gendered. Bi women are more likely to be viewed as ‘actually straight’, their sexual orientation merely a performance to attract straight men, whereas bi men are frequently seen as going through a ‘phase’ on the way to coming out as gay. Personally, I’ve had previous colleagues and friends be thrilled, when I left a long-term relationship with a woman and started dating men, that I had finally ‘come out’ and embraced my ‘true’ sexuality. While I was in this relationship, I also had members of the LGBT community accuse me of ‘betraying the cause’ of LGBT acceptance, which made me doubt whether I in fact had any place in the community. Even on dating apps, I’ve found that I get more matches with both men and women when I remove any mention of my bi identity from my profile. I can only assume this is because of biphobia from both LGBT and non-LGBT people, and to have this discrimination coming from both sides doesn’t feel great. Added to the above is also the problem of media representation. Depictions of bi identities are still extremely rare on screen, and when they do feature, they often fall into the usual pervasive negative stereotypes. In fact, the general public are as likely to have seen negative portrayals of bi public figures as they are to have seen something positive. The challenges bi people face, often unshared by our lesbian and gay peers, can also have a huge impact on our lives and frequently mean we feel unable to be ourselves, even among our closest friends and family. For example, I did initially come out as bi to my parents (although I didn’t have a word for it at the time), but I remember feeling guilty for being unable to give them the certainty that I’d end up with a man; it’s only since I began working at Stonewall that I’ve been comfortable having an honest conversation with them about my identity. Stonewall research published last month exposed that for many the problem is worse than what I experienced: almost half of bi men (46 per cent) and a quarter of bi women (26 per cent) aren’t open about their sexual orientation to anyone in their family, compared to 10 per cent of gay men and just five per cent of lesbians. 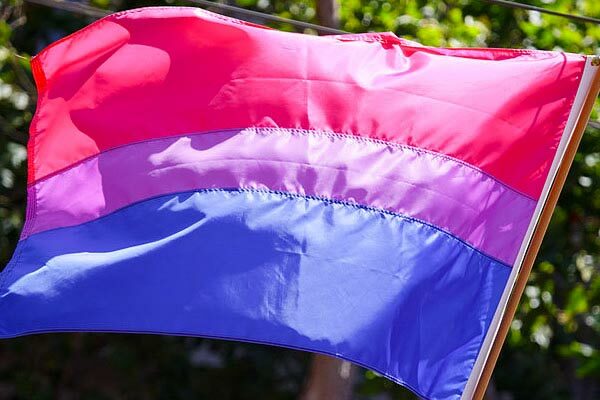 This means a huge proportion of bi people are facing the harmful effects of biphobia in their daily lives – the stereotypes, the invisibility, the lack of belief that bi people exist – without the benefit of support, reassurance and acceptance from their parents, grandparents and siblings. With this in mind, it’s not surprising that we have higher levels of anxiety, and lower levels of happiness and life satisfaction, than lesbian, gay and straight people. And these will be worse for those with other marginalised identities, for example bi people of colour, bi trans people, bi disabled people and bi people of faith. This is why we need Bi Visibility Day. It’s an opportunity to celebrate diverse bi identities, raise the voices of bi people, and call for positive change. Everyone has a role to play in achieving this: we need you to learn about bi experiences and the unique challenges we face; we need you to call out biphobia and harmful stereotypes, if safe to do so; we need you to not assume sexual orientation on the basis of someone’s current partner; and we need you to increase the representation of bi people whenever you can. But first and foremost, if you want to step up as an ally to bi people this Sunday: remember we exist, remember the stereotypes and assumptions we face every day, and think of one thing you can do in your daily life to help.